Doing Business in the Philippines. A prime location for business. The Philippines really is the most centrally located. 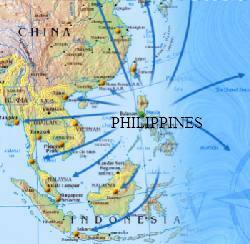 The Philippines is the perfect base for any company that wants to do business internationally. Being strategically located between two great trade routes – the Pacific Ocean and the South China Sea, the country is placed at the crossroads of international shipping and airlines. The Philippines is a vital entry point for over 500 million people in the ASEAN Market and a natural gateway to the East-Asian economies. The government and the private sector is taking advantage of the Philippines prime location, continuously promoting and developing different areas of industry and targeted economic zones, with many incentives for foreign companies to bring operations here. One of the driving forces behind this may be that the government is having difficulty keeping up with the ever-increasing demands on its budget. Whether it is for this reason or just a good business move, it is creating great opportunities for foreign investments and doing business in the Philippines. The Government redefined its role through the Public-Private Partnership Program (PPP Program) in 1990. Privatization allows the private sector to participate in developing infrastructure and many services that previously were the government’s domain. Since the PPP Program was started, limits on returns have been eliminated and the scope of projects available for investment has increased, and continues to do so. All business ventures involve some risk. To persuade investors to do business with the government of the Philippines, they will offer support through subsidies, guarantees and others to lower the risk factors. They will also guarantee supplies, provide logistical support with things such as raw materials, make energy resources available, and give right-of-way in certain situations. For the right projects, they will guaranty a continuous revenue stream, and in some instances, they will even provide loans. To attract as many investors as possible, the Philippine Government will allow the concessionaire to use public sector resources to pay debt service, capital costs, and operating expenses. They can also protect the investors from competition. There are many more incentives for long-term investment in business in the Philippines. Take advantage of this prime location for business and make the move that will lead to tremendous growth opportunities for your business. If you are interested in starting or expanding a business in the Philippines and want help from professional consultants, contact the DBC Team now for a free consultation. We have extensive experience with navigating through the process of establishing businesses in the Philippines.